Summer is winding down, and it's now or never for bucket list items. One at the top of my list for this season was a trip to nearby independent bookseller Anderson's Bookshop Naperville. 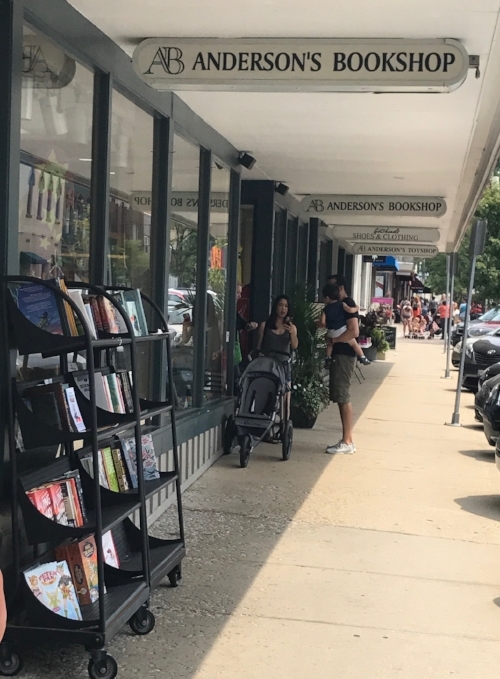 As a picture book writer and blogger, and a resident of Chicago's western burbs, I've been dreaming about getting over there since moving out of the city (and quite near Naperville). But life has been, shall we say, busy? Now that my three girls are a little older (the eldest is just starting kindergarten), we aren't so married to the sleep-eat-sleep merry-go-round and can get out of the house for four hours at a time. Baby steps. So this summer, off we went to Anderson's! Our crew met for the morning with the fam of fellow Chicagoland picture book writer Lisa Katzenberger. Lisa read our kids HERE COMES DESTRUCTO-SAURUS! by Aaron Reynolds, an author who recently visited Anderson's for a book signing. Super fun book with fantastic illustrations. While I was doing my best to have a coherent chat with Lisa, my girls kept bringing me book after book after book. Future publicists? It is the family biz! I gave each title a good look before trying to find its native real estate. It was a battle I was never intended to win. One book they proudly shared: WHEN PENNY MET POTUS. I'm Twitter pals with the book's lovely author, Rachel Ruiz, and knew her paperback edition was out. It was so exciting to get to see it firsthand and share it with my girls. Fabulous, fabulous book, Rachel! I especially adored their themed displays, including a section devoted to "books to bring to a baby shower," which prominently featured Kelly DiPucchio's LITTLES: AND HOW THEY GROW (Here's my Author Spotlight with Kelly). The browsing experience was top notch. Anderson's also prominently displays the work of local and visiting writers. I smiled when I spotted Renee Rosen's WINDY CITY BLUES (I met Renee at a recent writing conference, where she dropped a crazy amount of knowledge about book marketing). Our primary objectives for the visit were to explore the store, connect with Lisa and her kids, and leave with a very specific set of monsters. We did all three. Here's us test driving WHAT MAKES A MONSTER? by Jess Keating. As predicted, we determined it was an excellent fit for my non-fiction loving nephew. After a morning of great fun (despite my young tornados - my sincere apologies Anderson's staff! ), we spent a good long while in downtown Naperville. It was lovely. The last time I had been in the city's center it was winter. What a difference a change of the seasons can make. All three girls were asleep before we hit Mill Street on the short drive home. Thank you Anderson's for the gem that you are to locals and visitors alike, and for all that you do to support writers and the import of the physical book.